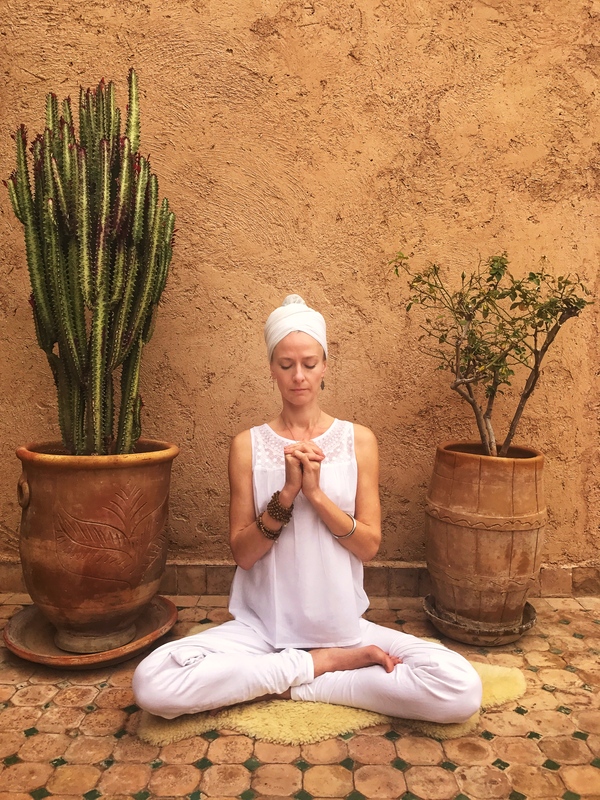 Kundalini Yoga has an amazing offer of super effective meditations and pranayamas (breathing techniques) to help you cleanse and purify your body and mind. We are happy to share one with you in this blog. In this Kundalini Yoga Pranayam Cleansing Meditation you work with a specific breath ratio, a mudra and a mantra. All great tools to help you quickly have an effect on your mind, make it more calm and pure. Plus many other benefits which we explain you step by step below. Enjoy this Kundalini Yoga technoglogy, it’s there to support you! 1. Posture: Sit in Easy Pose (Sukhasan) or any meditative posture that works for you. If sitting on the floor is not an option for you, you can also sit on a chair, making sure your spine is nice and straight. 2. 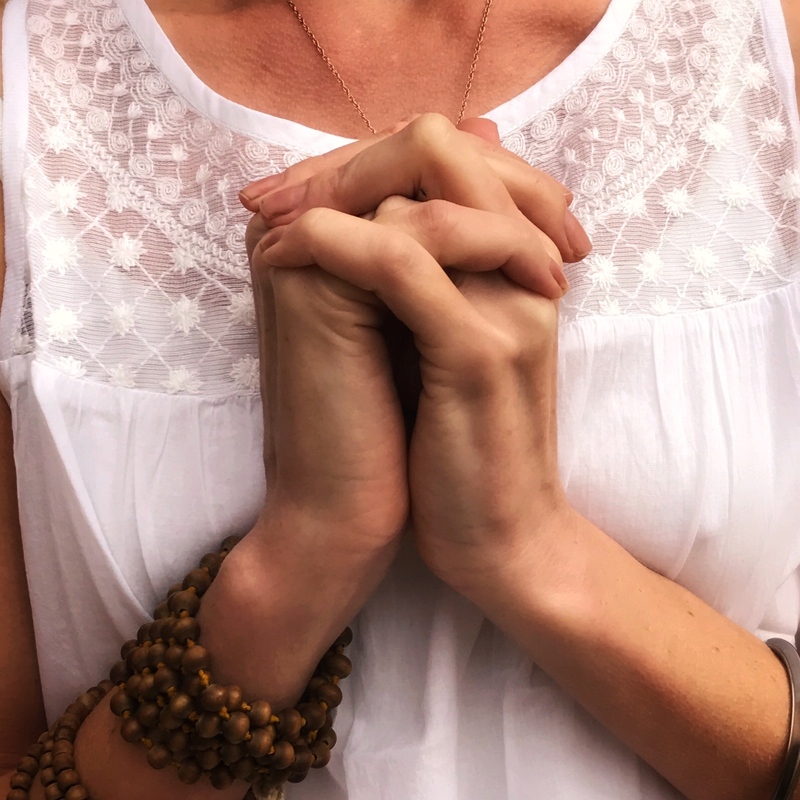 Tuning in: Bring your palms together in front of your heart center (center of the chest) in Prayer Pose, letting your thumbs gently touch your sternum. In this position chant the openings mantra ‘Ong Namo Guru Dev Namo’ three times. 3. Mudra: Now form the folowing mudra (seal of energy) with your two hands. Interlace all the fingers, except for your ring fingers. Point them down between the palms and cross them, pressing the pads fingers together. Close the palms together and squeeze. Place the mudra in front of the Heart Center. Keep the elbows pressed into the sides of the body. 4. Eyes: 1/10th open. Look down through your eye lashes. 5. Breath: Inhale in 4 equal sniffs through your nose, filling up your lungs, try to engage your navel, bringing it out a little further each inhaling sniff. Exhale in 4 equal sniffs through your nose, pushing all the air from the lungs in 4 equal parts, again use your navel, pull it in towards your spine on each exhaling sniff. 6. Mantra: Sohung. On each inhalation, mentally vibrate So (So So So So), on every exhalation, mentally vibrate Hung (Hung Hung Hung Hung). 7. Duration: Start with 3 minutes and over time build up to max. 11 minutes, by adding a minute every week. Then continue for 11 minutes straight. 8. To end: Inhale deeply in one stroke, hold the breath in a relaxed manner, feeling the expansion from within and then gently exhale in one stroke, relaxing the mudra. Rest your hands on your knees and observe the effect of this pranayama, feel the sensations in your physical body and observe your mind. Then inhale deep, bring your hands back together in prayer pose and close your meditation session by chanting the mantra Sat Nam three times. The sound Sat is extended (Saaaaaaaaat) and Nam is short. Let’s start with the mantras you are using in this meditation. Ong Namo Guru Dev Namo is an invocation which means ‘I bow/acknowledge the Inner Wisdom/Teacher. Through chanting this mantra you connect to the Golden Chain of all teachers that came before us and will come after us. It’s like you are tapping into an enormous field of wisdom. The mantra So Hung means ‘I am That’ or ‘I am Thou’, through chanting (or mentally vibrating) this mantra you acknowledge that you are part of someting way bigger then just your personal Identity, you affirm you are an inseperable part of the Divine. With the mudra we are bringing all the fingers together. 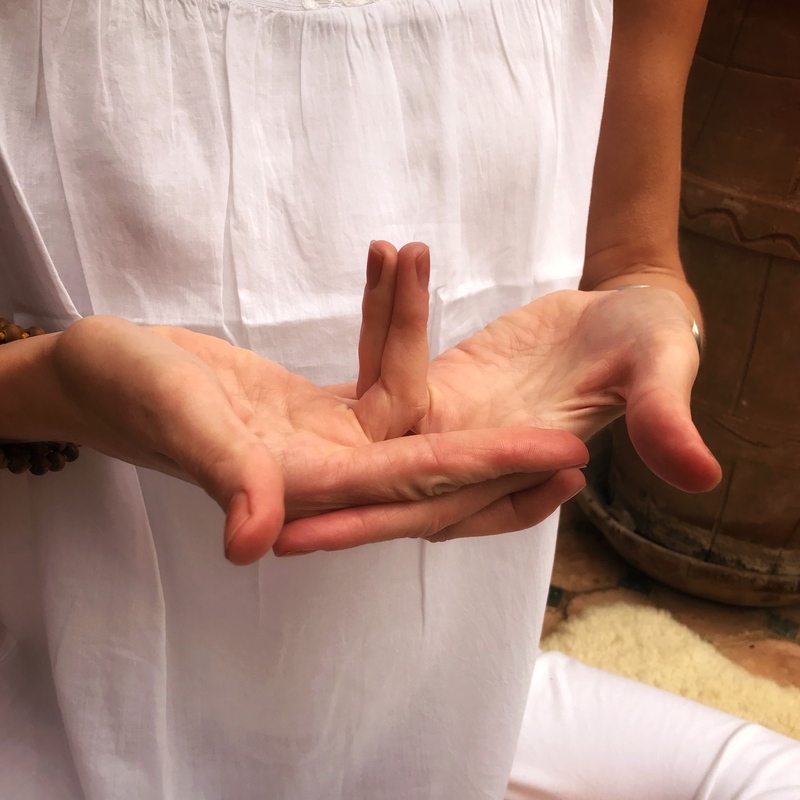 Every finger represent one of the five elements, in this mudra we bring all of them together, balancing the elements in the body, emphasing the Earth Element that is connected to the ring finger, the ones that are pressing together. This helps us to ground and balance and increases our endurance. The ring finger is also connect to the sun (Surya Mudra) which increases our health and vitality. It can help encourage positive change in your life and speed up metabolism and stimulate digestion. Finally with the 4/4 breath ratio we increase our clarity & alertness and trigger the glands, our guardians of health. Would you like to learn more about how to cleanse & purify your body and mind? 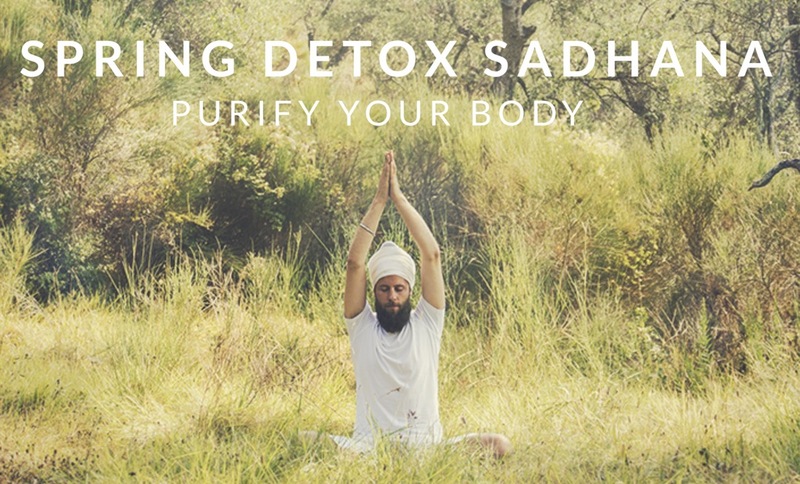 We are hosting an Online Guided Spring Detox Sadhana. A great opportunity to deeply cleanse your body and mind with a delicious Spring Detox Diet and a daily Kundalin Yoga practice with a gorgeous video. And of course many mouth watering Spring Detox recipes will come your way!